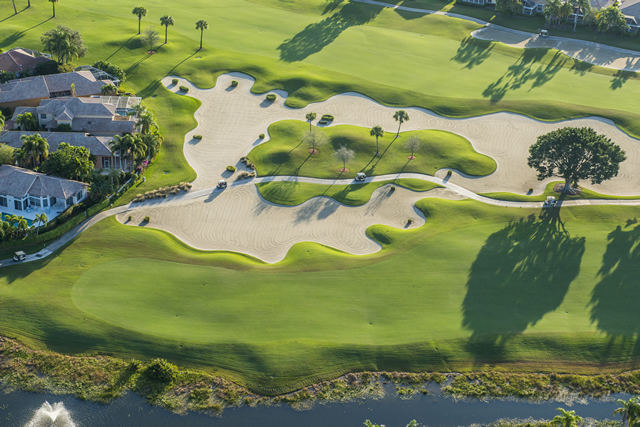 The Pelican Marsh community was created out of almost 2,100 acres of lush, tropical Naples real estate. It is enhanced by having 133 of those acres designated as preserves to protect the natural wonders that are so plentiful in this part of the world. Egrets osprey, heron, and other fine feathered friends may be seen from the miles of walkways that are ideal for jogging, cycling or just having a leisurely after dinner stroll. Pelican Marsh is a gated community with waterfront properties and amenities galore ideally located in the North Naples area and less than 2 miles to the beach! Homes for sale include both single family and condominium options with all the options you could want no matter what model you choose. Pelican Marsh MLS Listings - Updated Daily! In Pelican Marsh, there are eighteen single family communities and eight condominium communities. In the single family residence type, the sizes range from almost 1400 square feet with two bedrooms and two full baths, to luxurious homes for sale with up to 10,705 square feet under air, five bedrooms plus den, seven full and four half baths. Arielle condos range from 1500 to more than 1900 with multiple floorplans to choose from and options including a one or two-car garage available depending on the chosen floor plan all designed with the Naples lifestyle in mind. Pelican Marsh is located in North Naples, Florida with easy access from the intersection of US 41 and Pelican Marsh Boulevard, which is across from 99th Avenue North, with easy access to the beaches, marinas, and watersports that fill this area. An added bonus for Pelican Marsh residents is the beach access to Wiggins beach via the water taxi at Tarpon Cove Yacht Club located on Wiggins Pass Rd. With Pelican Marsh being in “the scene” is included. In this area of Naples, Florida, there are endless opportunities for arts, entertainment and dining options to suit all. In this area of note is that there are two must-go places almost right around the corner. The Baker Museum and The Naples Philharmonic is a joy to those who appreciate the arts. Great shopping is all around you. Shop at the Shoppes at Vanderbilt with shops like Treasures and Trends, Omaha Steaks and Mommy Shop to provide an eclectic, but complete, shopping experience. Dining options are ever present as well with everything from Starbucks Coffee and Cafe to the well-reviewed Lucarelli’s authentic Italian cuisine to the family friendly, informal, and fun Flaco's Mexican Specialties and Steak House.